Almost every Enterprise is in the middle of digital transformation wave spanning across the landscape of social media, mobility, Analytics and Cloud. However, Enterprises have a big challenge in managing the digital applications built across this landscape comprising of both custom built and out of box solutions. While the number of applications grows rapidly there is also an increasing demand from the business which puts Enterprise IT under constant pressure to improve their agility and provide faster response times to meet market demands. Therefore, Enterprises are in dire need of a solution to simplify the development and management of digital applications with little to no operational overhead. In this webinar, we will be focusing on how to address the challenges of managing multiple digital applications and bring in standardization in the way they are built and managed. 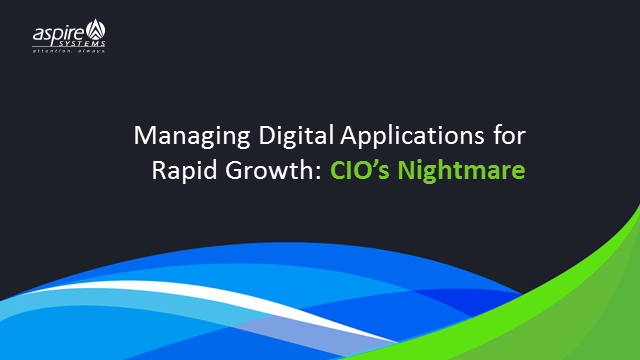 Join the webinar and learn how effectively you can improve business agility and achieve faster time to market through simplifying management of Digital Applications.